Let's review past month and also take a look at the retrospective for the year of 2015. BTW, also check 2015 summary of our products: Nimble Streamer re-defined, mobile SDK, DVR, MPEG-DASH, HEVC and more. December metrics calculations are based on 2 billions of views. 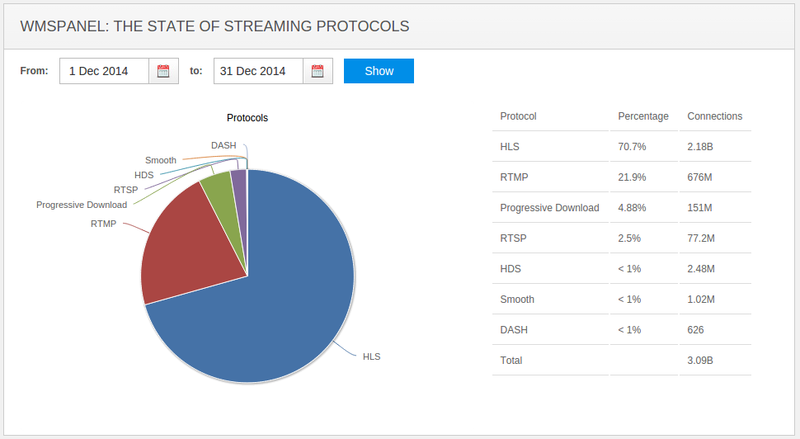 The stats are collected from 2300+ media servers (Nimble Streamer and Wowza). MPEG-DASH keeps growing, it has 12M+ views. It's now equal to Microsoft SmoothStreaming. HLS has increased to 74% now. You can compare that to November stats below. You can also compare that to December 2014 statistics. The HLS share was pretty constant through the year balancing around 70% between 69% and 74%. A significant change is the growth of MPEG-DASH which now has 12+ millions of views approaching to 1% share from just a few hundred views (literally 0% share) last year. Nimble Streamer DASH capabilities were transformed into a full-scale feature set so many of our customers made their bet on this technology. MPEG-DASH left HDS behind now competing with SmoothStreaming. Adding RTSP playback support in Nimble Streamer, along with its popularity growth, gave an increase for RTSP share as well. RTMP was continuously going down from 22% to 13%. This year again we saw the continuous evolution of streaming protocols towards HTTP-based formats. 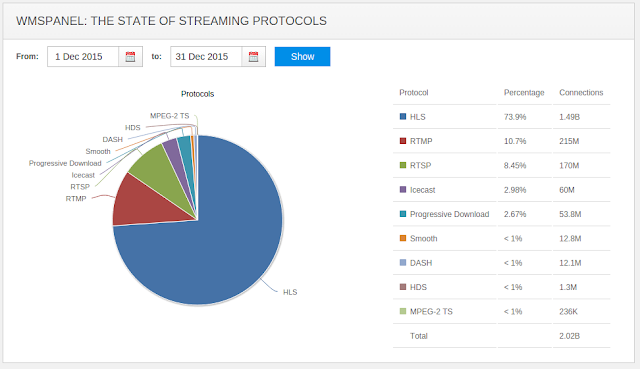 We expect MPEG-DASH to gain more popularity within 2016. We'll keep analyzing protocols to see the dynamics. Check our updates at Facebook, Twitter, Google+ or LinkedIn.